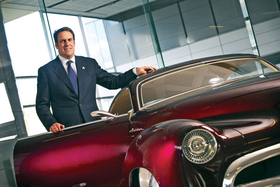 When Mark Reuss was named chairman of GM Holden Ltd. in Australia in 2008, he jumped in as more than a caretaker. His success, GM insiders say, was the reason he was recently named head of North American operations. For some executives, being posted below the equator at GM Holden Ltd., General Motors Co.'s obscure Australian subsidiary, might have been a kind of banishment. The Holden name -- not to mention its red, roaring lion logo -- draws blank stares from most Americans. The company has just one assembly plant and sells fewer than 150,000 cars a year. But when Mark Reuss was named Holden chairman in February 2008 as his first major overseas posting, he jumped in as more than a caretaker. Indeed, GM insiders say his success Down Under was the reason Reuss was named head of North American operations this month -- just a short time after returning from Australia in October to be vice president of global engineering. "He was the third chairman-CEO of Holden in as many years, so Reuss wasn't expected to do much," said Marton Pettendy, managing editor at GoAutoNews, an Australian industry publication. "But he became one of the most beloved CEOs ever at Holden." The challenges GM faced in Australia mirror what the company faces in the United States. The global financial crisis has hammered demand, and archrival Toyota Motor Corp. is staging a full-on assault. Reuss, now 46, moved quickly to revitalize the lineup, shore up local manufacturing and integrate Holden's resources with global operations. -- Bringing production of the Holden Cruze small car to Australia from South Korea. -- Rekindling exports to the United States with the Chevrolet Caprice police cruiser. -- Implementing flexible shifts to cut costs and save jobs. -- Introducing new technologies into the local lineup. -- Winning government aid for Australia's auto industry. Holden was Reuss' first international posting after 25 years with GM in various engineering jobs. Yet the American transplant won instant loyalty for fiercely promoting Holden's manufacturing and engineering talent. When the bleary-eyed Reuss first stepped off the plane in Adelaide on a Saturday morning, then-marketing and sales chief Alan Batey didn't whisk him to a hotel or the office. It was off to a V8 Supercars race, the Down Under equivalent of NASCAR, in the blazing summer sun. "You could say that was his first day on the job," Batey, now Reuss' successor as chairman and managing director, said in telephone interview. "He was blown away by all the fans in red Holden shirts. Mark really understood how strong the Holden brand is." It wasn't long before Reuss himself was buying vintage Holden cars, including a 1959 RHD sedan that echoes the looks of a '55 Chevy, and participating in Holden car buff events. Yet the fun was short-lived. One of the biggest tests came this year with Detroit's decision to kill Pontiac. Holden's assembly plant in Elizabeth, South Australia, had been churning out the Pontiac G8, known in Australia as the Holden Commodore, for export to the United States since 2007. At the same time, exports to the Middle East of such sedans as the Commodore and the Holden Caprice and Statesman were collapsing because of the economic meltdown. The Elizabeth plant, with a capacity of only 100,000 units a year, and its workers were suddenly in serious trouble. Reuss rode to the rescue with a couple of quick fixes. To replace the lost G8 exports, he brought in production of the Chevrolet Caprice Police Patrol Vehicle, a car that will be built in Australia and exported to U.S. law enforcement agencies in 2011. It is based on the Holden Caprice, a stretch version of the Commodore. He also dialed down production to fit shrinking demand -- with a big compromise. Instead of slashing jobs, Reuss negotiated a work-share program in which the plant's two shifts were reduced to one and the two crews shared the work, alternating on-and-off each week. "Mark was the architect of bringing flexibility into our plants," Batey said. By that time, Reuss was already popular for bringing in production of the Cruze small car, currently a GM Daewoo import, to Elizabeth late next year. Holden is adding a second line at the plant to make the car. And to help fund the investment, Reuss snagged $135 million in government money under Australia's green-car incentive program. In fact, Reuss was a key player lobbying the government for industry incentives in the first place. In late 2008, Canberra came through with $5.6 billion in aid for local carmakers. "It safeguarded the subsidiary's future at a time when it really could have gone either way," said Andrew McKellar, chief executive of the Federal Chamber of Automotive Industries, Australia's auto manufacturers' association. "He had a very successful, if brief, tenure here." To bolster the lineup, Reuss prioritized new, environmentally friendly technology. He brought GM's Active Fuel Management cylinder deactivation to market and launched the first Holdens with direct fuel injection. Under his watch, the Commodore got a new 3.0-liter engine, that model's smallest in 20 years, to compete with fuel-efficient Toyotas. Meanwhile, Reuss deepened Holden's development of alternative-fuel technology, as more Australians turned to liquid petroleum gas and ethanol. In January, he appointed an energy and environment director, Holden's first, to spearhead the push. Holden, once Australia's No. 1 brand, had the title usurped by Toyota six years ago. And when Reuss was called back to Detroit this summer, his race to catch Toyota was far from won. Before Reuss arrived in Australia, Holden had a 14.0 percent market share, compared with Toyota's 22.5 percent. Today, Holden's share has dipped to 12.7 percent and Toyota's to 21.3 percent. But this year, Holden's sales are holding up better than Toyota's. Holden's sales were down 9.8 percent through November. Toyota, by contrast, saw sales tumble 18.0 percent in an overall market off 9.3 percent. Reflecting recently on his time at Holden, Reuss recalled that Australians seemed at first to say: "You're another American coming in to run Holden? And why should we believe you?" And he was in a particularly difficult situation with the parent company -- GM -- bankrupt. "You become a stand-alone entity, and that's what we did," said Reuss, the son of former GM President Lloyd Reuss. "This was: 'Make your own luck; you're a long way from anyplace else; hope you guys survive.' Well, we more than survived." GM Chairman Ed Whitacre liked what he saw. Now he's banking on Reuss to duplicate his Australian success in the company's biggest, most important market. "He has real charisma to motivate people," Batey said of his former boss. "I'm sure that's something you'll see him doing in North America."